This is a quilt that I made for my mother-in-law. When I asked Mr. Maxtin about what color she would like, he said brown. Frown. I'm not a big fan of brown, but I know her living room is purple, so I incorporated that, as well as the complimentary color of yellow too. This quilt was started early fall, when I went on retreat (that reminds me, I'll have to tell y'all about that) and it is now done! It wasn't quite finished for her birthday early October but it is now, so I will bring it at Christmas to present to her in person. 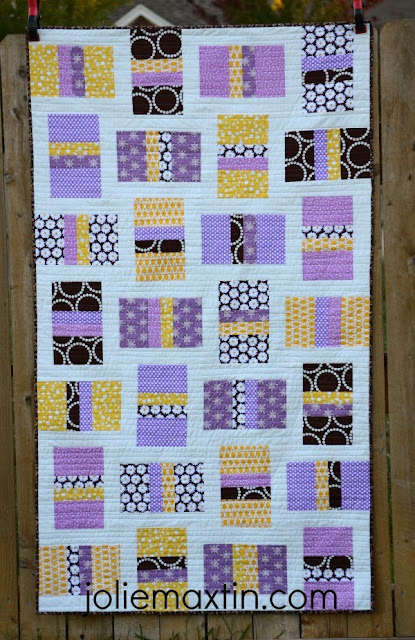 I chose straight line quilting and I'm falling in love. It's fresh, modern and just looks good - just wish it didn't take so long. great job brightening up the brown. It is really pretty. I'm sure she'll love it! I think it's lovely. She's bound to love it. Lovely! Ick to brown and beige! OOOoooOOOO!!! I love it! I mean, it was super cute when I saw the blocks but this is awesome! The quilting in spot on!